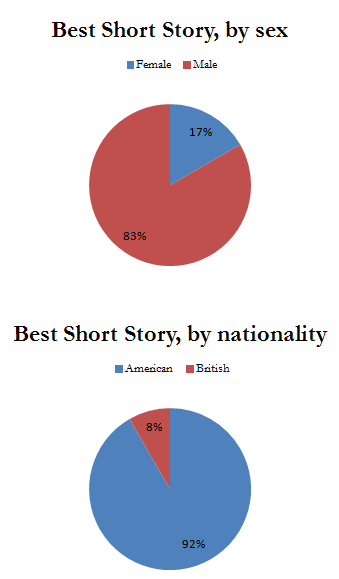 Best Short Story – some numbers. The Best Short Story Hugo is awarded to a spec fic work under 7, 5000 words. It was first awarded in 1955 and since then has been awarded annually every year, except in 1957. 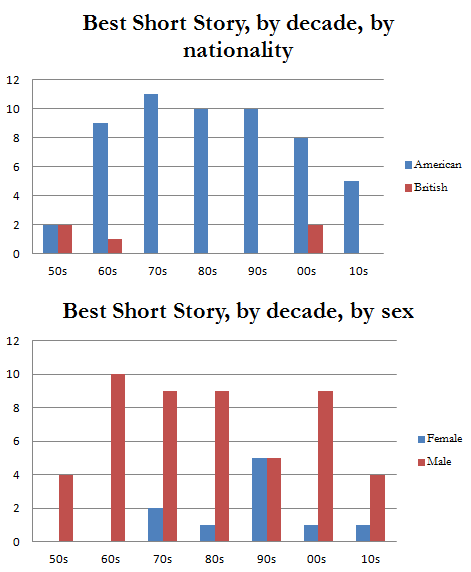 For a period in the 60s it was called Best Short Fiction and I believe it may have cannibalised Best Novelette during this time (until Novelette escaped). Since it’s inception 60 Hugos have been awarded in this category. The only shared win was in 1973. 10 writers have one more of this Hugo led by Harlan Ellison and Connie Willis on 4 and 3 respectively. Men have won 83% of this Hugo (50 wins). Women have won 17% ( 10 wins). 44 individuals have won one of these Hugos. 36 of these individuals are men (82%). 8 are women (18%). American men have won this Hugo 75% of the time (45 wins). As a consolation American women have won 10 wins (17%) – double the rest of the human race, which in this case is represented by five British male wins. I didn’t have any major concerns with this data set. I’ve probably still done something stupid though – so if you see something weird sing out in the comments. ← Hugo Demographics – Best Novelette.